OK, a wind farm isn’t making sausages, but it’s also not a farm. Nothing about this makes sense, unless you follow-the-money. John Constable and Matt Ridley outline the absolute rort that Scottish wind generators are screwing out of British electricity customers. Scotland already has 750 industrial wind plants (the scammers) in their best moments making a total of 5,700 MW which is more than the peak demand of the whole Scottish grid. This is, at times, not just more than Scotland can use, but even more than it can safely absorb, so UK slaves were forced to spend £1.8 billion on giant interconnectors partly to send the excess down to England and whatnot, otherwise the profits of the unprofitable might suffer, and the weather might not be as nice in 2100 (or not). If that’s not bad enough, these protected industrial plants sometimes produce a product when nobody wants it, and they still get paid. When it would be unsafe to dump it on the market. The geniuses who set this up promised the wind-generators that they would still be paid. And not only are they paid, but as Ridley and Constable document, before 2011 they were paid on average, four times what they would have lost, and one farm, 20 times as much. After that was exposed, the payments were trimmed to merely being 50-100% more than the loss. Nice work if you can get it, and even better if you can’t. In a free market, buyers connect with sellers. In a socialist-planet-saving-scam the buyers go to jail if they don’t pay for a product they didn’t use and don’t want, and the sellers connect with politicians who only represent 10% of the buyers. The people deciding whether to build or approve or invest in building most unneeded, unwanted, bird killing windmills are not the ones who pay for the product. Every new windmill is an automatic feeder off British forced consumers. So it’s in the Scottish governments interests to milk this situation for all it’s worth and approve every tower. What will stop them turning the whole of Scotland into a giant welfare windmill? Maybe only a hard Brexit with Scotland left behind. Bear in mind some poor Scots have to put up with these towers, and they’re protesting, but drowned out by the river of gravy pumped from the south. The layers of stupid don’t end there. Some corporates may be scamming both sides of the border. There are companies wanting to build even more towers in Scotland, but on the south side of the equation, they may be the same ones being paid high rates to rush in and fill in the missing supply at the last minute when the Scottish wind turbines are told to switch off. There is a unseen price for the volatility of wind power. Absolutely believable with wind power , without the subsidy they wouldn’t exist . BUT, according to the brainwashed internet warriors, they do not need fuel. And when coal fired power stations have wet coal they cannot operate. Worse: “The battery (no mention of location) will solve our electricity price problems. Wind farms are parasitic loads on the grid, the economy and Civilisation itself. Repeat after us, Scotland: intermittent, diffuse, unstorable, unreliable, land-hungry, unsightly, ridge-destroying, coast-defacing, noisy, dangerous, intrusive, incompatible, old-fashioned, unimaginative, medieval, subsidy-gobbling, expensive. Also, only renewable if you can find a mug who wants to renew the rickety crates. ‘What giants?’ asked Sancho Panza. These giant wind turbines sure take up a lot of land. that increase fossil fuel consumption and CO2. Try political ugly, useless, embarrassment, to all of humankind! Hey…I forgot DEPENDENT. Don’t forget how much naughty hydrocarbon energy is involved in the mining, processing, manufacturing, transport, installation and supplementation of whirlygigs. I mean, where would Jay be without all that Victorian brown coal? It’ll be funny when we’re all dependent on imported diesel for our “temporary” and “transitional” energy needs…and then the kissing really stops in the Middle East. Not funny ha-ha, but funny. Remember when wind proponents used to talk about certainty in the rules and regulations so the investors would be willing to risk their capital? That “certainty” was guaranteed profitability which if expressed more clearly would have been tougher for the pols to swallow. And risk of capital? There was none. It’s remarkable how much system gaming comes with sustainable solutions. Remember when 47% of the European ETS money was being spent on making and destroying HCFC’s in China? It’s no wonder China pays lip service to sustainability. Hmmm. Personalize the profits, socialize the losses. Crony capitalism at its finest. invalid anyhow. What I’m really looking at is Krupp or IG Farben. Or, for that matter ‘insurance’ under Obamacare. Here’s a truly radical thought. Assume we accept society taking care of those who can’t help themselves. Suppose we accept that pols won’t ever resist spreading more goodies to those not in need, to buy votes. given to individuals to consume with in an unfettered marketplace. The essence of the left is that we can’t live our lives properly unless it is done under their direction. to help you are the most terrifying words in the English language. the politicians propose and the public ‘servants’ dispose. Can you name any accepted proposal that has resulted in LESS Regulation and LESS public servants. I am reminded of the story from 1959 of a backbencher (in a Tory landslide) asking why it was necessary for a public servant to be escorted by guards from the Foreign Office to the bank 5 evenings a week to have a locked brief case filled with money chained to his wrist and then be escorted back to the Foreign Office basement to be locked in a vault overnight before being escorted back to the Bank in the morning to return the briefcase. The vault was large enough for a table and chairs, a camp bed, lighting and cooking facilities (also apparently a radio). After immense pressure this turned on a WE (approx. 1909) when the then Foreign Secretary Lord Grey had to visit Paris urgently after the banks were closed. He solved his cash shortage by visiting his friend Lord Rothschild who extracted a bundle of notes from the bowl in the foyer left there in case family members needed some small change. On his return Lord Grey repaid the loan and issued an order that henceforth a suitable sum should be kept in the Foreign Office premises in case the foreign Secretary needed same. This was parleyed into decades of overtime for F.O. staff as the one locked up overnight in temporary comfort was entitled to 16 hours overtime and time off in lieue. Why the sum could not have been placed in the vault as happened at week ends was not disclosed. Never! GB and also AU have a wonderful Monarch that can ‘reluctantly’ eliminate\dissolve any non functioning parts or the whole government of both places. You are so lucky! Implore the Queen to dissolve whatever is needed; and start over with new idiots not ‘yet’ so corrupted! Please pity the USA that long ago discarded such now needed Monarch! USA folk are so damned smardt! Far from dividing; every cruel insulting name eventually turns into a badge of HONOR! I do admit I are a white Anglo-Saxon male of German\Polish (kraut\pollack) decent! So what! I am honored having both parents using the (threat) hickory stick to help infants become persons! I graduated from hi-school with scholarship to Michigan state university. They held that until I got out of the US-NAVY. WoW! Mom and Pops were so gentle with me! Got out of the Navy and received a BSEE from MSU. Since then many rewards but still struggle to survive! So now what punk? H/T to Konrad who understands. In the military, some key posts must be manned 24×7 in case a quick response to “something” might be required. During the day-time watches, regular tasks are performed by the persons manning these posts. But during the night time watch, which lasts from eleven o’clock at night until seven o’clock the next day the person on watch is permitted to sleep. Given that the person on watch gets the entire next working day off, the night-time watch gives an excellent way of sleeping off a hangover from the night before, whilst still avoiding any real work. It is probably just as well that “something” never occurred. NorthWestern Energy’s recent statements likening my colleagues to “children in need of discipline by a parent” took me aback. This rhetoric is unprofessional and incorrect. NorthWestern is unhappy with a series of recent PSC decisions. Specifically, the PSC has determined that unless a new power plant can demonstrate benefits to consumers within 10 years, it should not be pre-approved by the PSC. Exactly the same in Australia! You have to buy certificates, at $895 a Mwhr or 8.5c kw/hr but that is in addition to buying electricity. This money is for sausage production and money goes to the windfarm whether they sell or not, no matter when the power is produced. Any income from sale of electricity is in addition to mandatory payment for the certificates. Even the certificates do not exist. They are trades on a computer system run by the Clean Energy Authority, so you do not even get Carbon indulgences. It is the world’s biggest carbon tax x 20, $400 a tonne at retail for Natural gas and $200 a tonne for coal. Ten times Gillard’s Carbon Tax. Consider our carbon tax is double on Natural Gas per tonne of Carbon Dioxide. So it is a far bigger tax on gas. Governments wonder why gas is so expensive and gas in particular? They might also wonder why middle men, even State Governments are making record profits selling electricity? We have a class of politician who would wonder if their pants were on fire and have to ask a consultant. For solar panels, installers get cash around $8000 a system. Our money. This is 15 years Carbon Tax in advance, despite the fact that for the first 8 years the solar panel is just paying back for the Carbon Dioxide cost of manufacture. Then we are forced to buy these lunchtime sausages which no one wants. A poor analogy as sausages are more popular at lunch time. People really want electricity at 6am and 6pm, not 12pm, but who cares? We are paying to save the planet from Climate Change. When CO2 steadfastly refuses to change, we keep paying. This is an absolute ripoff monstrous tax which is wrecking this country and no politician understands why electricity is so expensive? Really? Weatherill blames the banks, the market, the grid, everyone else. He might even be slightly more unpopular than Daniel Andrews in Victoria. Now our Labor Green PM wants a CET. You would think the RET did not exist. Grid before RET = cheaper reliable electricity. It seems that hysterical claims that renewables are cheaper than conventional methods have brainwashed our politicians. The truth is that the current wholesale price aplies only to conventional generation ($85-115 depending on State) whereas renewables cost that PLUS the RET Certificate ($85-90) or near double. Indeed before the RET coal fired stations pumped out power at $35-45 a MWh year after year. Thanks to variable renewables cutting their market and forcing them to provide (unpaid) backup the cost of electricity has more than doubled. Indeed if you figure renewables at $180 per MWh (the current profitable arangement) with coal fired at $40 an hour you have a ready explanation for the rise in electricity bills. And the recent rise is for roughly 10% renewables. With both major parties aiming for far higher levels of renewables it is plain that electricity bills will escalate. Not only that but the rise will affect food prices, close small businesses and drive industry offshore. Almost certainly a depression looms within 12 months. And we have to pay our politicians to achieve this. WTPFM ! (Words That Pass moderation Fail Me). Thanks, TdeF. Very interesting. 8.5 cents for ‘sausages’ added to your bill. It turns out the answer to contain power prices is competition from more renewable energy and energy efficiency. Co-incidentally this is also the answer to deliver the government’s emission reduction goals. Tony from Oz will have conniptions. A new paper released by energy market analysts Tristan Edis and Ric Brazzale finds that over the past two years Australia’s east coast National Electricity Market has experienced a profound, decisive and permanent unravelling of conditions that kept Australia’s east coast wholesale power prices low by international standards. Under the guise of reducing the cost of living, the Federal Government has abolished the carbon tax, wound back the Renewable Energy Target by a fifth, while also freezing energy efficiency standards. Yet prices for power on the forward electricity contract market are now trading at levels double what the wholesale market price was when the carbon tax was in place. They are now some of the highest in industrialised world. They’re blaming the abolition of the carbon tax and a winding back of the RET for the increased cost of electricity. Louis Carroll, where are you? I want out! Here is a novel and different approach: What say, we deliver electrical power to the general domestic household consumer at the minimum price of generation from, say, hydro generation (which has low operating costs). All non-domestic power attracts the government imposts, such as the RET and the Politicians Christmas Club. This must be paid by the industrial users, who will pass that on to the end consumers, who have the choice of paying the extra margin placed on whatever they purchase, by the supply chain, or forgoing the purchase all together. Good for sustainability, good for the environment, good for the economy. I am semi-lucid, for once. Does that make sense? Fiji Dave, the 8.5c is at wholesale. The rule of business is to double your costs, so 17c at retail!. No wonder the middle men are making squillions. The justification for doubling your inputs is the cost of money and labour, in advance of payment. Sometimes you double your costs and still make a loss. However with electricity this is not true. You are just a middleman and do nothing. Better, you do not have to surrender the certificates in advance so you can collect the invoice today, earn interest on the cash and pay for the LGCs later! You even make interest on the cash flow for nothing. This all makes the middlemen rich. You may have noted that AGL announced a 1 Billion profit. Of course this makes the product unaffordable, but where are the poor consumers going to go? Ha! Windfarms? Neither windfarms nor solar are on demand electricity. Solar does not work when you want it and Goldilocks windfarms work only when they like not when you like. So you are paying in advance for a right to buy wind and solar power which is never there when you want it and so far and cannot be stored currently if ever. Then when you do buy the windpower, even when you do not want it, you pay double for the actual power as windpower is NOT cheaper than coal. As a wholesale carbon tax, the RET cripples everyone downstream, every product, every service. Even the government, your government has to pay more for electricity, say for hospitals or lighting. More taxes. So while the Queensland Government is thrilled with the profits from electricity generation, they should check their costs for the extra 5,000 people they have hired. Then you get the silent subsidies at state level to keep businesses going. Billions, often to overseas companies like American Alcoa and Japanese Mitsui and French Engie and Dutch Nyrstar. Billions. To keep jobs making products which are otherwise too expensive to sell thanks to outrageous power prices. Plus now we have 30,000 families receiving payments for electricity they can no longer afford. A river of money. Finally, at least half of this cash vanishes overseas forever, so unlike a domestic Carbon tax , we Australians see no benefit whatsoever. Help! We are being robbed. The robbers are government licenced and administered by the Clean Energy Commission no less. Repeal the RET. The system would to normal quickly. If the government wants to build windmills, announce it in the budget which is already $20Billion a year in debt, not counting the while elephant NBN which is $60Billlion in debt. Total debt is now over $500Billion under Malcolm’s Liberals. We had no debt under Howard. Then you have Turnbull’s dreams, his second airport a Badgerys Creek, his Very Fast Train, his Snowy Mountain II, his Gonski II. The only thing missing are more pink batts, but they were only $2.5Bn. Now we have a postal plebiscite on gay marriage. Why? Surely the government has better things to do than debate the rights of gay people, a lifestyle choice which should not even be a question for government. A civil union is legal in every state. Not my understanding. The certificates they receive are based on MWhr delivered into the grid. So if the wind isn’t blowing, they receive nothing. However, I don’t know what the situation is if they are requested to reduce production to maintain grid stability. The wording of the explanation has changed subtly but significantly on government sites recently. Previously it was made clear that any payment for electricity sold was in addition to the income from the creation of LGCs. Now they are implying that the power has to be sold to qualify for a certificate. (1) The nominated person for an accredited power station may create a certificate for each whole MWh of electricity generated by the power station during a year that is in excess of the power station’s 1997 eligible renewable power baseline. Again legally, there is no mention of the word SOLD. This is what Jo’s article is saying about electricity in Scotland. Or maybe a case of the sporran wagging the pig……or sausage……. One can’t help be reminded of the Yes Minister British sausage episode, where EU mandates threatened to stop the British making their own sausages. Climate change has had a significant impact on the timing of river floods across Europe over the past 50 years, according to a new study. In some regions, such as southern England, floods are now occurring 15 days earlier than they did half a century ago. Prof Blöschl says that this study shows clear evidence of the impact of human-induced climate change in many regions – but there are still some areas of uncertainty. “Where the human imprint is obvious is in the northeast of Europe. It is quite a direct link, with a warming climate and earlier snow melt,” he said. Like other Pacific islands, Guam may be affected in the coming decades as climate change prompts shifts in weather, temperature and oceanic acidity, according to the EPA. It is not a British sausage – it is an Emulsified High-Fat Offal Tube. I like sausages but by the time you skin and gut them , there’s not much left . Our wind farms sell their sausages off the the retail networks at twice the cost they charge their own customers… and our retail networks have to buy them or buy them off the government. The subsidies are also a spur to Scottish Independence. The problem for Scotland is that on its own it would have a Government deficit of around 12% of GDP – or around £20bn. The subsidies for onshore wind farms are about £45 MWh and up to double that for offshore. The 5700 MW capacity working at 30% capacity would generate £6bn in subsidies. More if you include off-shore wind. When the wind does not blow, it is English mostly non-subsidised gas, coal and nuclear that supply Scotland. So it is a nice little earner for Scotland. 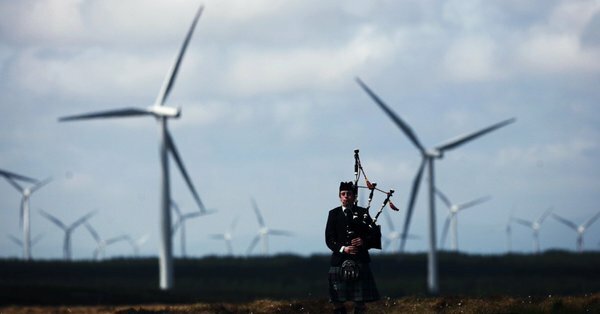 Renewables do not close the gap on the Government Deficit by nearly as much as £6bn, but without renewables socialist Scottish Nationalism is dead. So the support for Global Climate Warming Change. And direct EU subsidies to Scotland and Northern Ireland. Clever bureaucrats in Brussells rewarding the small players for staying in the game. We have the same with Adelaide. They get all the windmills. We pay for them. The reality is that they do not work very well and everyone loses. The funny thing is that there is plenty of energy in these areas and they have been turned into economic baskets cases by the Greens who have covered deserts and mountains with endless windmills and high voltage powerline so as to preserve the untrammeled vistas. Does no one see a problem with that? Everybody does not lose. The politicians get status; ideologues a false sense of saving the world; the wind farm operators get steady and high returns on their investments; as do already wealthy landowners who rent them the land. But society as a whole is a massive net loser. That’s positive. My belief is that many of the ideologues have no interest in saving the world. That is their public position. Their real purpose is much more sinister. There have always been such people. Clean Development Mechanism (CDM) projects in Africa have been good for Beijing and they thank socialist Christiana Figueres for her effort. Only a hundred years ago, no one had electricity. Or radio or telephones or iphones or computers or microwaves or dishwashers or electric transport or cars with starter motors and generators and headlights and … Energy was from steam engines, steam shovels, steam locomotives, cable cars pulled with steam power, high pressure water driven by steam power. Coal not only powered the machines, it powered our societies making multi storey building possible. Even in the 1960s there were water operated steam driven lifts operating in Melbourne and London. It took the people who hate modern society and want communism to invent a way to cripple us. A big tax on electricity making the power unaffordable. They blame the industrial revolution for wrecking the planet with an appalling 0.8C of unnatural warming. So stop the world. This has worked. It took from 2000 to 2014 for the LGCs to bite, but now they do. $85 each. For nothing. At wholesale. Consider though that 1.9Million people work for our governments, maybe over 2million with councils. With 10million Australians in full time employment, that’s 20% of the government. Maybe another 20% work for institutions wholly government funded like wages for private schools, medicare for private hospitals and subsidies for Alcoa and now we Victorians own a loss making timber mill, to save the trees. The wages have gone up an unprecedented 25% in the last five years, far outstripping public sector wages. Yes, they pay tax but we have to give them the money to pay the tax. Most importantly their electricity bills have gone through the roof too and we have to pay that as well. Consider how much of our taxes now go to pay cash for the RET, only to flee overseas or enrich private foreign companies. How much has the RET cost Australia? Just the $6Billion in taxes for nothing? No, far more. All for nothing, a fake idea that in the thesis of our previous Minister for the Environment until last year was “make the polluters pay”. We are paying and paying and paying. For nothing. Fake news, fake warming and fake science but a very real and massive cost intended to push us back to steam engines and high pressure water for power delivery. We might get our cable cars back though. Actually we could not even have steam engines. Malcolm’s new CET Carbon Emissions Tax will kill that too. We are not allowed chop down trees or even lift litter from the forest floor or fish or graze cattle. What do the Greens actually want people to do without energy, food or heat? Or is that their solution to overpopulation, in Australia which imports over 1 Million bicycles a year. None made here. Or aircraft. Or cars. Or ships. Or submarines. Or much else soon, steel, aluminium, lead, zinc, petrol. Steel though may be rescued by another overseas company. If you cannot shut it down, sell it. The sausage factories are moving overseas with our cash. We send the billions overseas and get no sausages. A weak and fearful mind will always find security in a soylent green sausage. Right on TdeF. Not even hunter gatherers, not allowed to eat meat so just gatherers. I guess if the Greens have their way, the sausages we get will just get smaller and smaller until we are vegetarians. The Greens are taking the long term view on coal and sausages. If we will not stop using coal, they will tax it out of existence. Meat too. So now they are trying the incredible story that if we eat less meat, we will save the plant a bit more? Politicians are desperate for the Green vote, so sausages will go up in price while the volume goes down. Best of all, we pay and get no sausages at all. That’s save the planEt. Save the plant is a new idea. Woodsman spare that tree. Should make it easy to follow the money then. All part of the wider plan to eradicate the concept of a country. Pulverize the economy, add UN Globocult open borders policy, whisk in destabilising social policies, fold carefully with incompetent politicians, add a mix of catastrophe spice, blend well with a large amount of micro-regulation. Finally, add a garish multicoloured lay of icing. Experts told BBC News that the assertions made by former Chancellor Nigel Lawson on Radio 4′s Today programme were simply untrue. Lord Lawson had claimed that global temperatures had “slightly declined” over the past 10 years. However, scientists working in the field said the records showed the complete opposite to be the case. But speaking in a follow-up discussion on Friday morning (LINK), Dr Peter Stott from the UK Met Office said the former Chancellor had got the facts wrong. “We know that 2016 was the warmest on record, over a degree warmer than late 19th Century levels, so this claim that we heard from Nigel Lawson that there’s been cooling is simply not true,” he told the BBC. His view was echoed by Prof Richard Betts from the University of Exeter. “The official figures do not show that the global mean temperature ‘has slightly declined’. In fact, they show the opposite – global mean temperature has increased during the past 10 years,” he said in a statement. PHOTO CAPTION: Former US Vice President Al Gore is promoting his new climate change film in London. On Thursday, the US National Oceanic and Atmospheric Administration released its 2016 State of the Climate (LINK) report, stating that the year was the warmest in 137 years of record keeping. It was suggested to the former Democratic presidential contender that he was going further than the scientific consensus but he said researchers around the world were “virtually unanimous on this and have been for decades”, adding that “record downpours” in the UK were a result of climate change. PETER STOTT: “If you take the global picture, the IPCC said very clearly that it is very ***likely that human influence has contributed to observed global-scale changes in the frequency and intensity of daily temperature extremes,” he told the Today programme. Many scientists took to Twitter to express their dismay at the airing of what they say were false claims. Physicist and BBC presenter Professor Brian Cox said it was “irresponsible and highly misleading to give the impression that there is a meaningful debate about the science”. so chilly some nights at the World Athletics championships, commentators talked of how difficult it is for records to fall. The UK has faced wet and miserable conditions over recent weeks with temperatures falling as low as 2C in North West Scotland on Sunday night. June was the sixth wettest on record, according to the Met Office while July was the 24th wettest since 1910. “It’s understandable given how cold it’s been over the past few weeks, but consumers need to consider the impact it will have on their energy bills. One in three Brits said they would usually wait until the end of the school summer holidays in early September to consider switching the heating on. And three in ten have also dug out the winter woolies to cope with low temperatures. Met Office spokeswoman Nicola Maxey told the Daily Express: “Rainfall for June was 55 per cent above average and July was 37 per cent above average. “And in the first ten days of August, rainfall is 43 per cent above average. ever see FakeNewsMSM report criticism of MSM inviting CAGW alarmists on, for decades, to push CAGW ? “For [the Today Programme] to bring on Lord Lawson ‘in the name of balance’ on climate change is both ignorant and irresponsible. Shame on you,” wrote Professor Khalili, a physicists and science broadcaster, who often makes programmes for the BBC. The invitation was extended to Lord Lawson despite a BBC report in 2011 which found the corporation had irresponsibly covered climate change, and that it needed to do more to avoid presenting opposition to environmental science as an equally valid part of debate. That report has been followed up numerous times by the BBC and it was found that it had made some progress. Today discussed the BBC Trust’s findings on air at the time, debating the report’s claim that it “often gives undue prominence to ‘marginal opinions’”. More recently, the BBC was forced to apologise for a documentary that criticised the Met Office and said that it shouldn’t be investigating climate change. “In giving voice to climate-change sceptics, it failed to make clear that they are a minority voice, out of step with the scientific consensus, which we would normally expect on the occasion when we include such viewpoints,” it said. The case against CAGW needs to be made by a scientist to have any credibility. Lawson is an economist – and, for those of us who suffered under his Chancellorship, not a very credible one. Brian Cox is a physicist, but a particle physicist and astronomer. That hardly qualifies him to comment on the weather let alone the climate. In Australia, his defence to a challenge on Global Warming was to quote NASA as the people who put men on the moon, with the clear implication that no one in NASA could be deceitful or politically motivated. In fact there are lots of retired NASA people who are speaking out against the idea of man made Global Warming and no one knows what man made Climate Change means if it is not Global Warming. It is odd to hear blind faith in the pronouncements of others from any scientist, the voice from authority argument from a scientist who should in his very nature be a skeptic who wants everything proven. That’s what being on the BBC does to people. The US has Bill Nye, mechanical engineer. Australia had Robyn Williams, British physics graduate and Tom Jones understudy. Would they have jobs if they voiced a different opinion. No. A bit like our Chief Scientist. They are political jobs. Fred, so many scientists cannot speak out. Certainly not if you work for NASA for example. There are few private scientists and most either do not care for this or dare not speak out. Dr Murry Selby is superbly qualified and lost his job immediately when he told that truth in Germany that CO2 is not correlated at all with temperature. He proved it. However his credit cards were immediately cancelled, his return ticket to Australia and his tenure. Coincidence apparently. Murry Selby has a number of excellent videos on Youtube. So have many other scientists. However there is also the problem that a lot of scientists do not like the limelight, are not good speakers and not used to aggressive debate and handling the typical leading questions thrown at anyone who questions their ‘Science’. The usual forum is to invite a skpetic to be abused by the audience while other panelists egg them on. So what has saved the skeptical cause is blogs like this, Youtube and the ability to access the data, as we have seen with the latest Bureau of Meteorology scandal for data adjustment, editing, deletion, homogenization, destruction. Trump and Abbott are the only ones who consider this all fabricated science. In Abbott’s word, crap. From a scientific perspective its down to a negative NAO. Dr Peter Stott from the UK Met Office said the former Chancellor had got the facts wrong. ..this claim that we heard from Nigel Lawson that there’s been cooling is simply not true,” he told the BBC. Dr Stott, when the temperature goes down, isn’t that called cooling? Apparently not. So when the temperature was up, that was actually the influence of El Nino. Stange, we thought it was man made Global Warming? The word they must not utter, cannot say, must deny is ‘cooling’. Warming of even 0.001 is warming even if due to El Nino. Cooling of 0.001 is simply not ‘as warm’ and due to the lack of El Nino, not actual scientific cooling. Lord help us. This man could replace Sir Humphrey Applebee. I remember Peter Cook and Dudley Moore’s use of the word sausage. Every word starting with ‘s’ had to be sausage. So She Sells Sea Shells by the Sea Shore became Sausage Sausage Sausage by the Sausage Sausage. Problem is, no sausages. The country has been turned into a not sausage shop. All our sausages are imported. A bit like Monty Python’s Cheese shop. The government says you pay anyway. The sausage shop has to make a living. It is foreign owned. The energy industry’s bet on a green technology boom in British homes could be scuppered by consumer fears that fresh innovations designed to cut bills will prove too expensive. Major energy companies, rival suppliers and tech-based start-ups are all hoping to tap the emergence of new ‘green’ energy solutions, such as solar panels and electric vehicles, to create a booming market in the UK. But new research from YouGov shows that the vast majority of British homes are wary of high upfront costs, and indifferent to energy efficiency. “It’s quite clear as a nation, we’re using more electricity,” said Steve Cox, director of engineering at Electricity North West. A fifth of those surveyed said they are not able to heat their homes properly but 70pc have never sought advice on how to save energy at home and 39pc have admitted that nothing is stopping them from making efficiency savings. There’s a new model emerging for growth-starved utilities looking to profit from America’s solar and wind power boom. Quite interesting. But incomplete. No mention of RET, or the year-round reliability of coal fired generators. Burning all fossil fuel reserves would lead to unprecedented changes in climate so severe that they will challenge the existence of our society as we know it today. burden of human population does not deplete the earth’s resources and managers(sic) the environment responsibly. After the blowback, the Times sent a modified tweet removing the original question. Trials in Denmark carried out by Nissan Motor Co. and Italy’s biggest utility Enel SpA showed how batteries inside electric cars could help balance supply and demand at times and provide a new revenue stream for those who own the vehicles. While the Tokyo-based automaker has trials with more than 100 cars across Europe, only those in Denmark are able to earn money by feeding power back into the grid. There, fleet operators collected about 1,300 euros ($1,530) a year using the two-way charge points, said Carranza. Shultz’s clarion call on reducing nuclear weapons is only matched by his appeal for world leaders to take action on climate change and continue to fund research and development with both public and private sector investments. Cheryl Conway, who provided Lloyd and Hunter with more than $600,000 between 2013 and 2015 to establish the Lupunaluz Foundation and build the Lupunaluz Retreat, has filed an application in the federal court seeking damages for misleading or deceptive conduct and breach of contract. According to the statement of claim filed in the Victorian division of the federal court on 1 August, Conway says she spent $566,756 on building the retreat and a further $48,704 on establishing the not-for-profit foundation. Edify Energy said on Friday that its 150MW Daydream – announced on Thursday – and now the 50MW (AC) Hayman solar farms in Queensland were set to be fully operational in 2018 after it secured “one of the largest solar portfolio financings to date in the Australian market,” with BlackRock Real Assets. The investment, which gives BlackRock a 90 per cent interest in the 2ooMW solar portfolio, marks the international investment company’s first foray into renewables, through a fund focused on investing in wind and solar globally. The two projects also have a combined $90 million in financial backing from the Clean Energy Finance Corporation, as part of a syndicated debt facility involving the Commonwealth Bank of Australia and French investment bank Natixis. Tweet: Tristan Edis: Brilliant job by @theprojecttv explaining power price rises. 9 minutes dedicated to power market a brave thing for such a program. Twitter: 11 Aug: Brian Cox: My timeline today is a rich source of data on ‘climate skeptics’. 97.8% are men over age of 65 and average number of followers is 4.6. Reply: Paddy Burns: Flat earth brexiteers no doubt! Reply to Prof Brian Cox: Hard Brexit: What a supercilious and sneering remark ! You’ve become a modern-day Soapy Sam . Climate change isn’t a religion now, or is it ? Yeah, off topic I know, but who would have thought. I’m still doing this Base Load thing, and of interest was the earlier Thread of Joanne’s, which piqued my interest on power consumption. So, here in Oz, we now have six of them, well five really now Point Henry has closed and even Portland in Victoria is only operating at one quarter capacity. China has, umm, 120 Aluminium smelters. Jobs. No matter how renewable energy pushes up electricity prices, it cannot be seen to destroy jobs. Green energy was supposed create jobs, not destroy them. You cannot make aluminium profitably with the world’s most expensive electricity. It is surprising that Portland is making anything at all. Daniel Andrews and Jay Weatherill should just buy it and pay people sitting down money. It would be cheaper. Give them jobs in the CSIRO researching Climate Change. Australian coal and iron ore is now the backbone of the South Korea shipbuilding industry, one of the largest in the world. My younger brother lives in a Glasgow suburb, but is a keen hill walker and mobile home enthusiast. A couple of years ago, when we met up for a joint holiday in Provence, I commented on how Scotland was being ruined by wind turbines. He quite angrily assured me that was not the case, so I dropped the subject. I have just emailed him the link to the article which Jo has provided, so it will be with some interest to see if I get a response. I recently posted on Instagram a picture of Stirling Castle surrounded in the background by wind turbines and there was not a cheep from my widespread family members who normally comment on all my postings. Looks like none of them like to face the truth! I have two younger brothers. I visited one of them two years ago and somehow we got to talking about the climate and he mentioned the need to “manage” carbon, a term I hadn’t heard before. When I laughed and asked “why” his wife dismissed me with “don’t be a sceptic Ian” in a way which immediately closed the subject. Not in my family it’s not . Peter, on my last visit to the UK in May of this year, I was appalled at the ‘welcome’ to GLA supplied by the acres of wind turbines as we were descending. They were the first thing visible between the clouds. On the way down to Cumbria some beautiful scenery was blighted by the wretched things (the same on the way back of course). There are so many blighting the Solway Firth it is unbelievable anyone could approve this. Cumbria is also blighted in many parts, ditto North Yorkshire. Flying into MAN also. Grrr. Unseasonable high temperatures today: CH9 Weather tonight, Saturday. 21 Deg C is about average for the lower north coast of NSW this time of year. The drip, drip, drip, brain washing exercise of the MSM in intolerable. Branch out people to the blogs, spread the truth to the uneducated, indoctrinated. Here’s another scam aspect of the wind industry, also involving the UK. In Denmark, wind turbines earn their owners a subsidy for a certain number of years after installation. Once that period expires, so do the subsidies. Danish wind turbine operators are dismantling older turbines that no longer qualify for a subsidy, then shipping them to the UK and other countries for re-installation, and collecting a whole new round of subsidies for the same turbines. Who will save the environment from the environmentalists? Yeah, I feel the target alright, its right over my wallet! I describe our RET like this. Imagine if a government said to Coca Cola, that for every case of Coca Cola it sells, it has to pay Pepsi for two cases of Pepsi, but Pepsi only has to deliver to Coke an Invoice but not the Pepsi (certificate). In exchange for this the government also tells Coca Cola that all the shelves must be empty of Pepsi before it is allowed to sell any Coca Cola. Because no-one actually wants to drink Pepsi, the government then arranges the public to drink Pepsi by plain labelling Pepsi and Coke as “Cola”, so the public can’t choose between Pepsi and Coke, when they really just want to drink Coca Cola. This illustrates exactly what this unconstitutional madness does! An Acton couple are facing 30 years in prison after filing for more than $50 million in grants from the 2009 federal stimulus bill meant to spur the economy out of the Great Recession, in order to reimburse themselves for wind farm and biofuel projects the U.S. Department of Justice claims never happened. The couple are alleged to have submitted fraudulent application to the U.S. Department of the Treasury for energy grants as part of the American Recovery and Reinvestment Act of 2009, which provided tax-free grants to individuals and businesses who utilize wind farms and gasification systems to convert trash into electricity. They received grants for more than $8 million, according to a statement. A DUP MP has warned of a “sinister and fraudulent” campaign to drum up support for a controversial wind turbine development in Co Antrim. An application has been lodged by Larne-based company Wind NI to construct seven massive, 400 metre-high turbines at a scenic beauty spot in the Antrim Hills. The proposal has been met with a chorus of condemnation, with objectors fearing the development, near the isolated village of Carnalbanagh, would be a blight on the picturesque landscape. Among those opposed to the scheme is former environment minister, Sammy Wilson, who claimed the wind farm would “desecrate” the local landscape. “When these residents received my reply, they were appalled because they were actually in opposition to the proposal and did not want these massive industrial turbines to be erected in the area. “They were appalled that their names had been used, that letters had been sent on their behalf purporting to claim that as local residents they welcomed the proposal. The News Letter contacted applicants Wind NI for a comment, but they were unable to respond at the time of going to press. Royal Bank of Scotland PLC is being sued for around £153.4 million ($199 million) by liquidators at accountancy firm Grant Thornton acting on behalf of Bilta U.K. Ltd. and other companies over the bank’s alleged role in a vast carbon trading tax fraud. The amended claim, submitted to London’s High Court on July 21 and seen by Law360 on Thursday, alleges that two traders employed at the bank’s commodities trading division, Mercuria, known as RBS Sempra Energy Europe Ltd., carried out a series of carousel fraud transactions. Under the scheme carbon credits — an emissions permit issued under European Union carbon trading rules — were imported into the U.K. by allegedly sham companies that were sold on to other supposedly fake firms. Creditors lost out when the companies later entered liquidation. RBS acquired around 44 million carbon credits between June and July 2009, mainly from CarbonDesk Ltd., a broker, which represented a sudden increase and unprecedented volume of trading with the firm for which there was “no commercially sensible explanation,” according to court documents. Brett Jolly, 56, is disqualified from running any British company for the next 11 years, beginning last Thursday. He confessed to investigators from the Insolvency Service that he allowed carbon credit investment firm Anglo Capital Partners Limited to trade ‘with a lack of commercial probity’. Investors were told to expect returns of up to 25 per cent when the truth was that Jolly’s company had already marked up the price of the carbon credits by as much as 594 per cent. Also, there was never a two-way market that would allow buyers to turn their certificates back into cash at any price. Jolly, of Southend-on-Sea, admitted his sales staff lied to investors. In a statement to the Insolvency Service, he confessed: ‘Anglo’s salespeople told those they called that they were ‘bankers’, or were calling from a ‘bank’.’ Victims lost at least £1.02 million. Jolly is now believed to be in the Far East. The Office of Gas and Electricity Markets (Ofgem) website provides breakdowns of suppliers’ costs and overall pre-tax profit. According to the latest figures, for supplying gas, the big energy suppliers have done well of late, making a return of 10 per cent before tax. On electricity, however, the companies have actually been losing money – 1.72 per cent before tax. Looking at dual-fuel bills, combining both gas and electricity, the companies have a pre-tax profit margin of 4.26 per cent. That’s higher than in some industries, like supermarkets, where profit margins have fallen to close to three per cent, but it’s peanuts compared with the profit margins of tech companies like Apple, Microsoft or Google, which are more like 26 per cent. It’s one thing to give low-carbon energy sources a helping hand to establish themselves. But why are we continuing to subsidise wind and solar power? Why are we penalising fossil-fuel energy sources? If renewables are rapidly becoming cheaper and more efficient, as green-energy proponents claim, surely they can now compete? Apparently not. TdeF, thanks for your useful research re the LRET. I know the legislation appears to say that large renewable generators get to create one LRET certificate per MWh ‘generated’, but I still cannot understand how the worked example using a hypothetical 100 MWh (nameplate) generator, as shown on the CER website here (http://www.cleanenergyregulator.gov.au/RET/Scheme-participants-and-industry/Power-stations/Large-scale-generation-certificates/Large-scale-generation-certificate-eligibility-formula) calculates that it is eligible for 90 certificates (=1.8 certs / MWh) when it only delivered 50 MWh to the grid, at the same time on the same page it states that renewables generators are eligible for only one certificate per MWH delivered to the grid, see ‘DLEG is the net eligible electricity generated and exported to a distribution network, transmission network or a point of use.’. If the legislation says something different (as you cite in # 7.2.1.1) then shouldn’t we be asking the CER (or the responsible Minister) to resolve this. After all, there were about 20 million of these certs created last year, currently worth about $1,800 million. If the formula is wrong (as I believe it is), then the subsidy was up to $800 million above what it should be. If on the other hand you are correct (that they get 1 cert per MWh produced (rather than delivered to the grid), then there is no need for the eligibility formula. You can see a public example from Hepburn Wind farm annual report. They declare annual generation 2015/16 financial year of 9872 MWhr with a 27.5% capacity factor, and revenue of $437k from electricity sales and $744k from certificate sales. So about $43/MWhr from the wholesale price and $74/MWhr from the certificate sales to retailers. That was from FY ending 2016. Since then wholesale prices have risen to over $100/MWhr, so net profit should certainly be on the increase from the $213k declared last year. Without certificate sales they would clearly have made a significant loss. So electricity consumers are subsidising Hepburn wind farm. At least sausages could feed the poor if there was an excess … what good are windmills turning when they’re not needed? Enter Elon Musk, with a ‘solution’ to the ‘problem’. It’s super green to operate super large lithium and graphite mines powered by diesel and to continuously dump or recycle masses of expended industrial battery banks full of toxic chemicals, apparently. £1.8billion for an extra 2.2GW interconnect (to add to the existing 3.5GW Scotland-UK and 0.25GW Scotland-NI interconnects) compares pretty well with the £9.5billion that was foisted on the Scottish taxpayer to build the Torness reactor which they didn’t need and which was subsequently flogged off to a privatised french-run company. In fact, there is now a 650km Scotland-Norway interconnect being planned, too, to add to the UK-Ireland (1GW), UK-France (2GW), UK-Holland (1GW) connections. I’ll hold off commenting on Ridley’s yarn about how the Scottish electricity market works until after I’ve read up on it from a reliable source. Since when have you followed reliable sources, Craig? If you did you wouldn’t say even half of what you post. Tho I can only dream of 17c cabbages.